We have already talked about what are and how thermal cameras work, but now it is time to do a quick look at what do thermal images look like usually. Thermal cameras do not actually detect color as the infrared range they operate in is way beyond the range of the visible light, instead they record thermal information and that thermal information is then displayed in a way that we can visually interpret it in the form of an image. To make it easier for people to easily analyze a thermal image visually it is represented using a false colors representing the difference in temperature and the most commonly used color palette for that is the so called Iron one (shown above) where black is for the coldest areas, then blue and purple for slightly hotter areas, the mid-range of temperatures is usually red, orange and yellow and then going to white for the hottest parts. 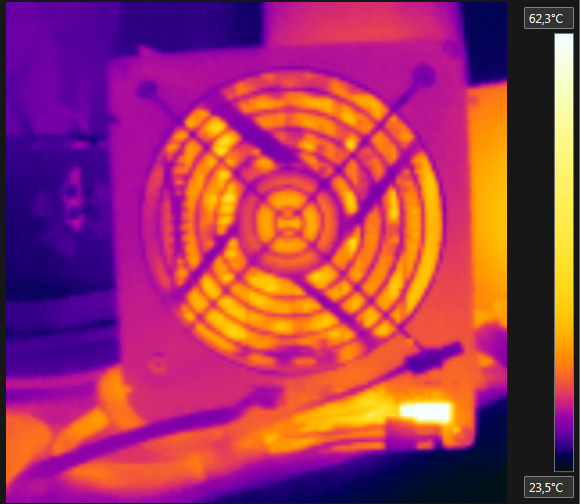 These false color visualizations usually do come with a small scale next to the image that show the colors used and what temperature range they cover as otherwise the person seeing a thermal image may get the wrong idea about the actual object temperature. It all depends on the temperature range that has been recorded, so black (the coldest part) on a thermal image can represent 0 degrees Celsius, 23.5 degrees C or another value and the same goes for the hottest and whitest part it could be 62.3 degrees Celsius or 200 degrees C. In thermal images using false colors to represent the difference in temperature there is no specific temperature representing specific color from the color palette used, the colors are just there to make it easy to distinguish the coldest from the hottest parts. Another very common way is to represent a thermal image is in the form of a grayscale image, where you get only black to white colors passing through various levels of gray to represent the difference in temperature. This way of representing thermal images is often used in thermal security cameras or night vision thermal devices, but you will probably see it rarely used in other areas when thermal cameras are needed. The reason for that is, because it is harder for a normal person to distinguish the difference in temperature when only a single color is used and only the level of intensity is varied. It is much easier when you use a color palette with multiple colors. 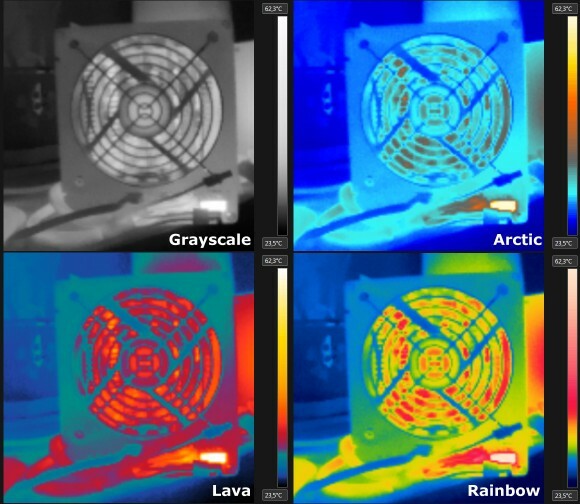 Aside from the most common Iron color palette that we’ve shown to you above here you can see some of the other often used false color representations used for thermal images. These are the Grayscale palette that we’ve already discussed as well as Arctic, Lava and Rainbow, and you may also find a versions of these with higher contrasting color palettes to make differences even more apparent. There of course could be thermal images using different color palettes as well, but as long as you have the smaller scale with the used colors and what temperatures they represent you should be able to quickly get an idea on what you are seeing in terms of temperature. Another interesting way of focusing the viewer’s attention to a specific area of the thermal image is to use grayscale thermal image with color only on specific areas that are either below or above certain temperature or if they fit in a specified thermal range.